Please join us for a ribbon cutting of MyFigueroa on August 30! Over the past few months, we've been hard at work adding the finishing touches to the Figueroa Corridor Streetscape Project. Now we invite you to join Mayor Eric Garcetti, Councilmember Jose Huizar, Councilmember Curren D. Price Jr., LADOT, the Department of City Planning, and Metro, as well as Figueroa area residents and business owners for a community celebration of MyFigueroa on August 30. There will be a morning walking tour highlighting MyFigueroa improvements in Council District 14, followed by a press event and celebration outside of USC's Galen Center. From there we will take Metro Bike Share bikes up Figueroa to explore the new streetscape features of MyFig. YWCA Jobs Corps Center, a job training and 200-unit affordable housing project that was the cornerstone of the State of California $30M Prop 1C Infill Infrastructure Grant that funded MyFigueroa. Pedestrian, cyclist, transit, and greening improvements—key features of MyFigueroa that support new housing along the corridor. The linear park-like improvements along 11th Street, providing broad pedestrian walkways, seating, pedestrian lighting, generous landscaping, and bike lanes. Figueroa Street bus stop islands, street trees, pedestrian and street lighting support the new buffered and protected bike lanes that connect people between home, work, and play in downtown and South Los Angeles. The approximately one-hour, 1.25 mile Walking Tour will start promptly at 10 a.m. and will end at Washington Boulevard where a complimentary DASH bus will take participants to the press event at the Galen Center. Participants are advised to wear a hat, sunblock, and comfortable walking shoes. Join Mayor Eric Garcetti, Councilmember Jose Huizar, Councilmember Curren D. Price Jr., LADOT, Metro, the Department of City Planning, and the California Department of Housing and Community Development outside of USC's Galen Center for the ribbon cutting of MyFigueroa. The event will include speeches from the sponsoring agencies and elected officials with media present. Participants are advised to bring their own safety gear, sunblock, and comfortable shoes. Personal bicycles are welcome as well. 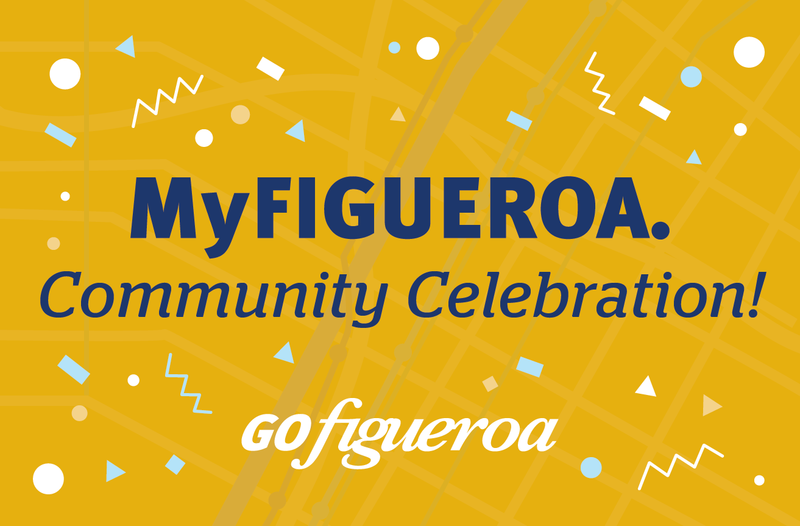 If you're unable to make the events on August 30, you can follow along using the hashtag #MyFigueroa on social media!